REDWOOD (GB) (Bay or Brown 2006-Stud 2012). 4 wins-1 at 2-from 1m to 1½m, Woodbine Northern Dancer Turf S., Gr.1. Sire of 101 rnrs, 56 wnrs, inc. SW Night's Watch (MRC Naturalism S., Gr.3), Rising Red, Romancer, SP Livin' on a Prayer, Rosewood, Swampland, The Heiress, High Mode and of Big Sur, Chamalu, High Sierra, I See Red, Red Sierra, Suliman, Tamarack, Woodloveto, Chief Sequoyah, Dashper, Haylin Rouge, Rakau Whero, Rock on Wood, Te Quiera, etc. ROMANCER (g. by Redwood). 5 wins. See below. SIRMIONE (Encosta de Lago). 4 wins-1 at 2-from 1400m to 2100m, A$1,894,375, VRC LKS Mackinnon S., Gr.1, Australian Cup, Gr.1, QTC Grand Prix S., Gr.3, Qld Tatt's RC Australia Post Tattersalls S., L, 2d VRC Australian Cup, Gr.1, MRC St George S., Gr.2, Fat Quaddies H., 3d STC BMW S., Gr.1, VRC LKS Mackinnon S., Gr.1, MRC CF Orr S., Gr.1, Queensland Derby, Gr.1, BTC Doomben Classic, Gr.3, VRC Bulban 2YO H.
Nicconi Poni. Winner at 1000m in 2017-18, 2d MRC Ladbrokes Info Hub H.
Toplayer. 2 wins at 1200m, 1600m in Aust. Winner's Delight. Winner at 1650m, HKJC To Kwa Wan H., 3d HKJC Panasonic Viera IDTV H.
Pownce. 2 wins at 1200m, 1400m to 2018-19 in NZ. SUNRAY (Zabeel). 6 wins from 1900m to 2500m, NZ$88,125, New Zealand St Leger, Gr.3, Rotorua Challenge P., Gr.3, BOP RC Morton Estate Sparkling H., Matamata RC St Petersburg H. Sire. ROCKING ON (Zabeel). 6 wins from 1600m to 2400m, A$247,950, Clarence River JC Grafton Cup, L, AJC Bigpond H., Convention Centre H., STC Hylands Sportswear H., Vodka Cruiser H., 2d STC Gold Slipper Festival H., Canterbury Leagues Club H., 3d AJC Manchester Unity H., Latin Knight H.
Macau Warrior (Keeper). 7 wins to 1350m in Macau, 2d Macau Sprint Trophy, L, 3d Macau Lisbon H., Advocate H., Macau Golden Group Fat Choy Bowl. Vengo. 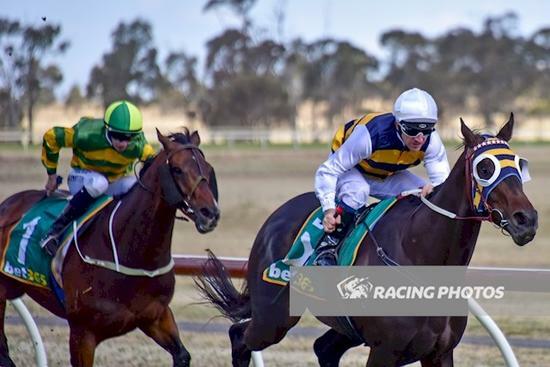 5 wins from 1400m to 2700m, A$182,780, VRC Sharp Direct H., Benalla Gold Cup, 2d MRC Salamander H., Beaulivre H., MVRC Bill Findlow H., Denise Arnott H., 3d VRC Longines P., MRC Big Philou H., El Golea H., 4th VRC Queen's Cup, Gr.3. Zabette. 4 wins from 1400m to 2200m in NZ and HK, HKJC Lok Sin Tong 120th Anniversary Cup, Ping Shan H., Queen's Road Central H., 3d HKJC Uranus H.
HEADCUTTER (Twig Moss). 4 wins from 1600m to 2800m, A$129,945, VRC St Leger, Gr.3, Bitalli Welter H., VATC Senior Citizens' Week H., 3d SAJC Adelaide Cup, Gr.1. MR MERRYMAKER (Marceau). 7 wins-1 at 2-from 1200m to 2000m, A$93,000, BATC Bernborough H., L, 2d QTC Grand Prix S., Gr.2, BATC Courier Mail S., L, 3d QTC Castlemaine S.H., Gr.2. Sire. FORCE OF IMPACT (Imposing). Winner at 2000m, VRC Eurovox S.H., L, 2d VRC Stradbroke H., QTC Fai Life H., 3d WATC Melvista S., L.
Lambert Miss (Danzatore). 2 wins. See above. GREAT COMMAND (Marscay). Champion 3YO in NZ in 1996-97. Head of The 1996-97 NZ 3YO Free H. Joint top of The 1996-97 Australasian 3YO Classification (2100m+). 7 wins from 1400m to 2400m, NZ$361,450, A$24,000, New Zealand Derby, Gr.1, Waikato RC International S., Gr.1, ARC Clifford P., Gr.3, Waikato Guineas, Gr.3, ARC New Zealand Derby Trial S., L, Avondale JC Auckland Veterinary Centre H., 3d STC Canterbury Guineas, Gr.1, Avondale Guineas, Gr.2. THE HOMBRE (Lucky Owners). 7 wins-1 at 2-from 1200m to 2000m, NZ$226,625, A$113,350, BRC Rough Habit P., Gr.3, 2d ARC Railway S., Gr.1, BRC Grand Prix S., Gr.3, 3d ARC Darley P., Gr.3. MISS PELEAR (Mr. Nancho). 5 wins-1 at 2-from 1200m to 1600m, NZ$154,212, ARC Rich Hill Mile, Gr.2, Waikato RC Health 2000 H., Rotorua RC Novotel Rotorua Lakeside H., 2d Counties RC Auckland Thoroughbred Breeders' S., Gr.2, 3d WRC Thorndon Mile, Gr.1, Cambridge JC Presland Tocker Insurance H., BOP RC New World Summer Cup, 4th Wanganui JC Fordell O'Leary's S., L.
WHO DAT SINGA (Iffraaj). 5 wins-1 at 2-from 1200m to 2200m, NZ$2,825, A$338,350, HK$308,350, WATC Melvista S., L, 2d Western Australian Derby, Gr.2. MILLWARD (Defensive Play). 3 wins at 2, A$660,260, VRC Sires' Produce S., Gr.1, STC Silver Slipper S., Gr.2, VATC Blue Diamond Prelude, Gr.3, 2d City Tatt's RC George Negus 2YO P.
Race Record: 24 Starts 5-2-4 NZ$90,875, A$60,300. 5 wins from 1200m to 1600m, NZ$90,875, A$60,300, to 2018-19, ARC Mufhasa S., L, 2d ARC Concorde H., Gr.3, 3d Counties RC Easter H., Gr.2, Te Aroha JC Team Wealleans H., ARC Twilight Cup.